Whatever brings you here, we are committed to making your experience truly rewarding. And as a destination city, nothing quite compares to New York City as the finance, entertainment, publishing and fashion capital of the world. Getting to the Javits Center couldn’t be easier. To get here, just follow these simple directions. While there is no parking at the javits Center are many parking garages throughout the Javits Center vicinity. See parking for locations and phone numbers of convenient parking near us. We are located on 11th Avenue between 34th and 39th Streets. Please keep in mind that the public transportation fare is $2.25. The subways accept MetroCards. Buses accept MetroCards and exact change fares. With MetroCards you can transfer from subway to bus and bus to subway for one fare. MetroCards are available at local stores. The NY Waterway operates a ferry from Weehawken, NJ. In just 8 minutes the ferry takes you across the Hudson River to 39th Street and 12th Avenue, just one block from the Javits Center. Just park at the convenient lot adjacent to the ferry terminal in Weehawken and take a ferry which leaves every 10 – 15 minutes during peak hours. Don’t have $35,000 for trade-show real estate? No problem! These guerrilla marketing tips will get you noticed anyway. Here’s a typical scenario faced by many young companies: You want to raise awareness of your company at an upcoming industry trade show, but you don’t have much money to spend. You know that participating in the tradeshow is the most effective option, but you can afford neither the high cost of booth space nor the booth needed to fill it. Nonetheless, it is critical for your young company to join the fray and get in front of potential customers, partners and investors. So, what can be done? In this situation, guerilla marketing can be a great strategy. All it takes is creativity and the ability to pull a stunt or two. No problem, right? Let’s get going. Before the show, visit the main venues and surrounding hotels. Figure out where people will walk, pick up buses, catch cabs, have lunch and meet for drinks. You’re trying to find the best locations for maximum visibility. During this initial reconnaissance, make friends. Meet the bell captain in the hotels that are nearby but aren’t part of the official show, say hello to the head of housekeeping and talk with the bar staff at local watering holes. These folks are integral players in the guerilla marketing game and can often make or break your campaign. Think about all potential “logo real estate” around the show and find out what real estate you can take over that the show is not already using. Look at hotel key cards for non-show hotels ($250 plus the cards). Ask your new friends crucial questions: would the housekeeping, bar or bell staff don a free t-shirt, hat or button with your logo? Do any of the hotels have in-room programming and can you be included? A fundraising mantra comes into play here: If you don’t ask, the answer is always no. Important note: stay clear of the things that are the purview of the trade show itself. You don’t want to get yourself blacklisted from future shows. You just want to take advantage of the larger ecosystem around a show to get some visibility for your company. There is a lot of room for everyone around a big event. Sadly, despite your research, some of the gambits you use to sneak your way into the minds of potential customers will be spotted and removed immediately. But others will succeed, as the hotel staff will naturally assume someone else authorized you to replace the hotel’s normal coasters in the bar with your logoed ones. All it really took was a tip to the bartender ($50) and customized coasters ($125). Try putting large buttons on the hotel maids ($100 tip/$100 buttons) and t-shirts on the bell staff ($200 tips/$150 t-shirts). Find the popular bars and tape posters in the bathroom stalls ($150) or put logoed toiletry baskets in the bathrooms ($250) that will draw attention to your company. Timing is everything. You want to execute your ploys in close proximity to one another and throughout the run of the show. As part of the action phase, expect some backlash. If someone gets mad, apologize and move on. Expect some losses. Most tradeshows host large evening events. Think about how you can maximize this off-site exposure opportunity. Give out hats to the local taxi cab drivers who will be transporting party goers and offer a $100 prize to any driver seen wearing one. Another idea is to hire a college drama group to stage a mock protest or a Flash Mob near the taxi and bus lines to highlight your product (as little as $300). Avoid impeding traffic flow and stick to public streets and you likely won’t run into any problems. Celebrity impersonators wearing your logoed item and a photographer can attract a lot of attention. Be sure to capture the contact information from those who pose with your stars, so you can send the picture to them and begin building a more meaningful relationship. This is a perfect thing in Vegas. While your company is starting off, these tips and tricks can make the difference between being remembered and being just another face in the start-up crowd. Later, when you’re successful and the company has progressed, you’ll have the option of spending $30,000 – $75,000 to do the trade show “properly.” You’ll likely look back on these shenanigans with a private smile. I still do. According to graphic-design guru Milton Glaser, “To design is to communicate clearly by whatever means you can control or master.” Simple enough. So why, then, are so many exhibit graphics unappealing, cluttered, and ineffective? Turns out, the key to successful graphics isn’t just pretty pictures. 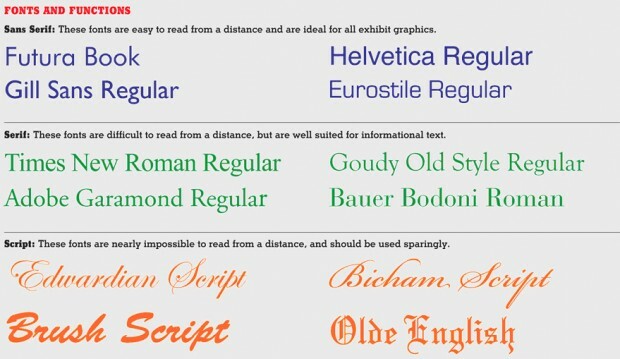 You also need a basic understanding of hierarchy, color theory, fonts, and density. After all, a picture may be worth a thousand words, but that means nothing unless those words communicate your key message. 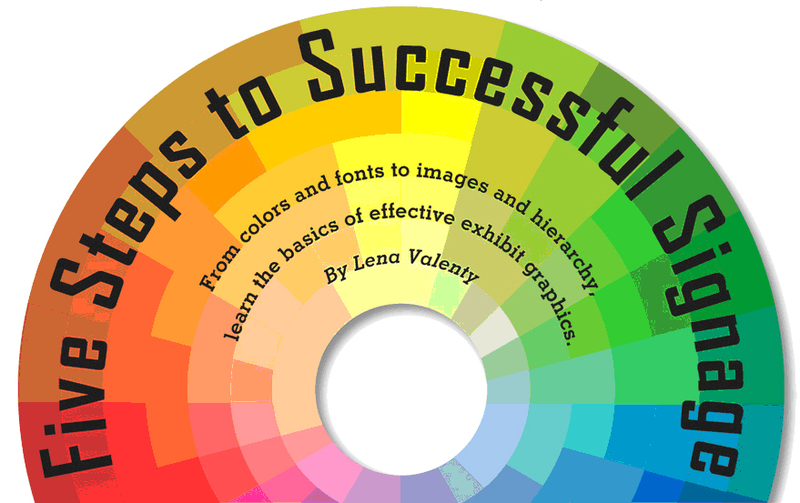 With that in mind, here are five steps that will lead to exhibit graphics that work. U. S. of Agriculture’s food pyramid. It’s an organizational tool that tells your brain how to prioritize informa-tion — a tool that when used correctly, can increase the effectiveness of your exhibit graphics. It directs your eye where to go, giving your brain mental cues on the amount of time to spend ingesting each bit of info. And when it comes to exhibit graphics, that direction is imperative as you have only a limited time to capture your audience’s attention. “Hierarchy dictates what the primary, secondary, and tertiary messaging will be, and as part of the exhibit-design process, it determines where each of those elements are located within the space,” says Mark Pearlman, design director at Alameda, CA-based exhibit-design firm Group Delphi. It’s the reason you see large banners overhead featuring a company name instead of, say, its mission statement. Exhibit graphics are the physical embodiment of making small talk with an attendee — there’s a beginning, a middle, and an end to that conversation. First, you introduce yourself. • Primary Level — Visible from 50 to 100 feet away, this level is the intro and contains company identification (such as a logo) and main messaging (such as a tagline). It attracts people to the space and hopefully hooks them within five to seven seconds as they walk by before something else catches their eye. • Secondary Level — Visible from 10 to 50 feet away, this level enables people to determine what they want to explore in the space. It usually comprises large static graphics and/or dynamic video associated with a company’s products and services to keep people interested and in the exhibit. • Tertiary Level — Visible from one foot to 10 feet away, this level is for qualified attendees who are genuinely interested in the company and its offerings. It should include graphics identifying demonstration areas, defining product displays, and promoting in-booth presentations. 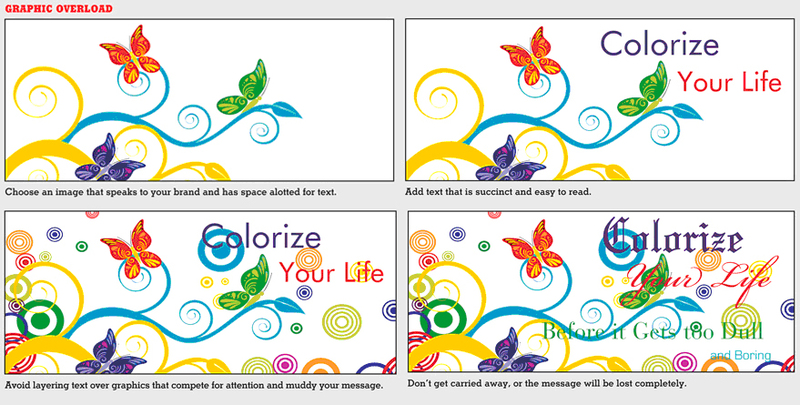 Once you have determined your messaging hierarchy, turn your attention to color. Your palette is likely dictated by corporate identity or an internal style guide. If that’s the case, your color options may be limited, but there are still guidelines for usage that you should follow, regardless of the hues you choose. “Contrast is key when it comes to color, especially if you’re placing text on a colored background,” says Brendan Dooley, senior graphic designer at the San Francisco office of exhibit house MC². Obviously, you want to pair light-colored text with a dark-colored background, and vice versa. But beyond that, there are certain color combinations that are more pleasing to the eye than others. To identify optimal pairings, consult a color wheel divided into primary (red, yellow, blue) and secondary (green, orange, purple) color wedges. 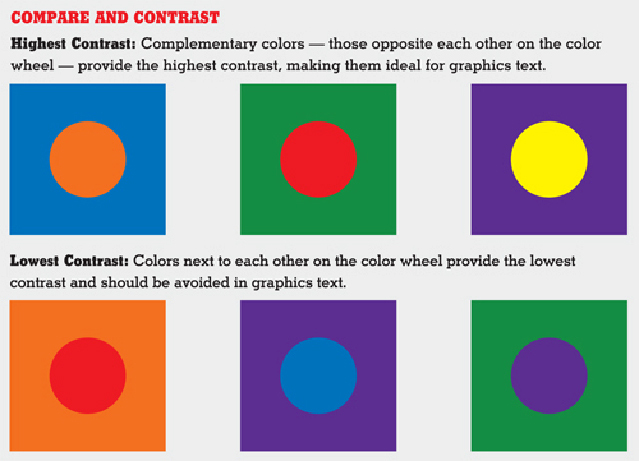 The color wedges opposite each other — called complementary colors — have the highest contrast, while the colors next to each other have the least contrast. For example, if your back wall is a shade of blue, and you want to overlay copy, choose a shade of orange to ensure your text is legible and your message pops. With thousands of fonts at your disposal, it’s easy to get lost in a sea of Comic Sans and Papyrus. Think of fonts as a tone of voice — they have the power to change your message, just as a person’s inflection can mean the difference between sincerity and sarcasm. Dooley says. “They are harder to read in a trade show environment and may be lost altogether from a distance.” The legibility issue is mostly attributed to the fonts’ serifs, which are like tiny tails that punctuate the letters. 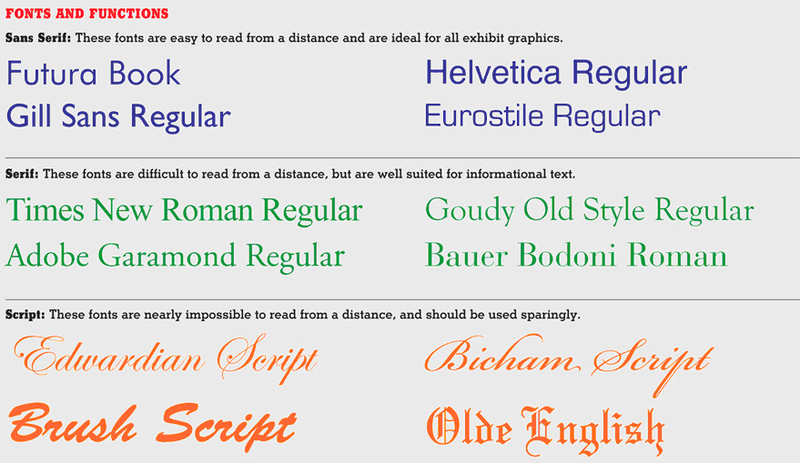 Examples of popular serif fonts include Times New Roman, Adobe Garamond, and Goudy. • Size — Break down text into bite-size chunks. A wall of text is useless (unless it’s being used as a design element), and does a disservice to the importance of the information that needs to be conveyed. If you can’t shorten the text, use bullet points to differentiate longer lines of copy. • Position — Keep text at eye level, between 3 and 6 feet from the floor. • Format — The clearest way to communicate large amounts of copy may be to develop print or digital pieces that attendees can explore in greater depth. The booth staffer can also help disseminate detailed information, negating the need for copious amounts of copy on your graphics. When it comes time to select photos, images, and supporting visual elements for exhibit graphics, balance is key. “Imagery, like messaging, should be used to support your overall brand and enhance the experience,” Dooley says. “When used together, images and text should complement each other and tell a much more engaging story.” But image selection should not be done independent of the hierarchy, color, and font decisions you’ve made. A good example of text that supports imagery and vice versa is the iconic Absolut Vodka print campaign created by New York-based ad agency TBWA Worldwide. The campaign, which boasted more than 1,500 iterations, featured an Absolut bottle (or outline thereof) somewhere on the page, accompanied by a short phrase across the bottom of the image that always started with “Absolut” and ended with a noun that pertained to the graphic. The font chosen matched the libation’s logo, and the phrase — typically two words — paralleled the construction of the product name. Granted, that example is the stuff of Don Draper’s dreams, but the traits that made the ads successful can be applied to exhibit graphics. The ad was easy to read and comprehend, and the brand identity was so strong that it became recognizable as an Absolut ad even in installments that didn’t feature the company’s logo. However, if text has to be placed on top of the image, follow these three dos and don’ts: First, ensure text is legible and doesn’t compete with the image for attention. Second, don’t overlay text on top of a busy image. If the image lacks an open area, use transparencies or color, such as a tinted text box, to separate the text from the image. Finally, don’t use special effects or additional artwork that conflicts with the image, your brand, or your message. Regardless of the imagery, font, and colors you select, your graphics still need to serve one primary function: communication. Think of exhibit graphics as your first impression, and make it a good one.